"Everything flows out and in; everything has its tides; all things rise and fall; the pendulum-swing manifests in everything; the measure of the swing to the right, is the measure of the swing to the left; rhythm compensates"
As we know from the first three principles, the world is defined in three planes: The physical, or the world around us; the mental, or the world as we perceive it; and the spiritual or subconscious, the world in a higher state of consciousness. We understand that everything we experience, everything that exists, is perceived through our mental realm, or "lens," and that these realms are positioned in the same place yet just a degree off, creating a vibration we know as energy. Through the last principle, we learned that dichotomies do not exist and that we must analyse all angles to find the proper intent before we begin altering that vibration. In this section, we'll learn about the natural laws of the universe and learn how to utilize them as part of our Craft. Your heart beats a steady pulse. You breath in and out, in and out, in and out. We sleep and we wake. We live, then we sleep again. The sun rises and sets, and rises again. The world grows cold and dim in the winter months, then bright and sunny in the summer, only to return to the cold. The Principle of Rhythm encapsulates all that moves, noting the natural pattern of mental states, life and the universe. Newton's First Law comes in to play with this principle, yet again showing the marriage of science and magic. Stating that "an object in motion stays in motion," we understand that this rhythm is unstoppable. Night will become day and day will become night. Life will turn to death and death to life. These are undisputed facts of the universe. The continuous swing of the universal pendulum is forever present; the only constant in this world is change. As the law clearly states, "the pendulum-swing manifests in everything." On the physical plane, it manifests in the cycles of the season, the rise and fall of the tide, the rhythm of the heartbeat. On the mental plane, that rhythm exists as the ebb and flow of thoughts and emotions. And on the subconscious or spiritual, we see it through non-corporeal entities, the opening and closing of the veil and the ethereal pulse of the astral realm. There is no escaping the pendulum. This swing of the pendulum manifests on all levels of consciousness - on all planes. Some Hermeticists would disagree, stating that this rhythm is purely low-vibrational, meaning it's only present on the lower plane. They state that only the adept magician can "rise above" the pendulum. Still yet, others claim to "control" the pendulum, the natural order or swing of the world. Both misunderstand. The rhythm of the world is the law of physics, the science of our behavior. We cannot act outside of science any more than we can force the pendulum to stop on any other plane, or escape it altogether. The reality is that we need to feel the rhythm the universe emits. We only recognize the extremities of our poles, be it physical, mental or spiritual, by having been there ourselves. Our return to each side allows us to experience the full range of the universe, from the hot and cold of the planet to the anger and love we emit. We are human and we are meant to feel these things, not hide them, bury them or attempt to stop the pendulum swing to return to that emotion. This is how we know we are alive. And remember: These emotions, these vibrations, are no more opposites than the "good" and "bad" we discussed in the last part of this series. Dichotomies do not exist but rather are a spectrum from which the pendulum swings about. Rhythm may be neutralized by an application of the Art of Polarization. If we're not rising above, or avoiding, the pendulum and we cannot stop it, how does this law apply? 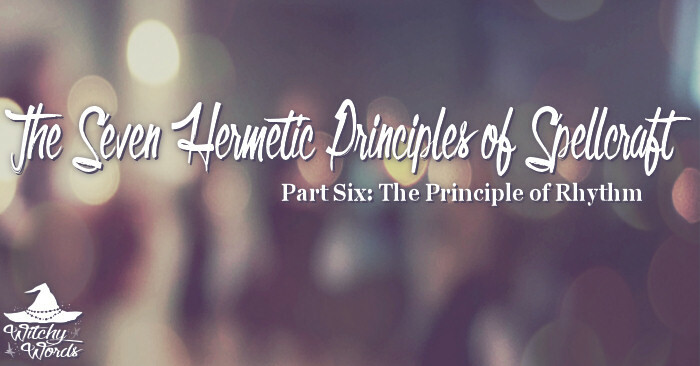 Two major components assist the Hermeticist in their work with the pendulum of the universe. The first is awareness. In order to apply the Principle of Polarity as seen in the last section of this series, we have to be aware of the vibrations emitted. We have to be able to understand the complexity of lower and higher vibrations. We have to be aware of the swing of the pendulum through each plane and what that means for our own vibrations as well as that of the world around us. With awareness, we can predict how things might unfold and understand our own internal reactions towards the potential results. Awareness allows us to react. 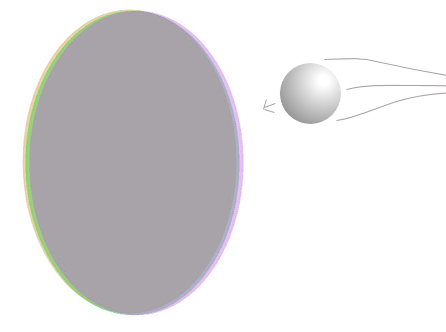 We can utilize the Principle of Polarity in two different ways to react to the pendulum swing. The first is to counteract the direction of the swing by neutralizing its momentum. If we know the pendulum will swing towards anger, we react in kindness. We pull in the opposite direction of the forward momentum to slow the roll. The other option is to change the spectrum the pendulum swings on. This method is a bit more complicated but achievable. If we know that the pendulum will swing in an undesired manor and we also know the pendulum swing cannot be changed or stopped, we instead shift the spectrum, transmuting it into something entirely different - almost like an alchemy of the mental or subconscious. Of course, this is the method to use if you want to change the outcome of the natural rhythm. If you're happy with the direction the pendulum swings, then you're fine right where you are! In the previous section, we defined the way our intent is aimed at the vibration of the three planes - almost like a baseball hurling towards our destination. In this portion, we identified another component acting as part of the three realms: The pendulum. Now that we see the pendulum swinging through the three planes, we better understand how to not just aim our spell work, but manipulate it to work in our favor. A pendulum is swinging through any space we choose to aim our spell: Finances, wards, luck, love, curses - the list goes on. At this point, we have to learn how to work with the rhythm of that pendulum. If it's swinging away from the aim of our spell, we're in luck. Magic flows towards the path of least resistance and our spell will likely be successful. Learning to utilize the natural swing of the pendulum is the easiest and quickest way for results. If it's swinging towards our aim, however, we will have to counter our spell in some way to protect it against that swing. This is the Law of Neutralization at work. Lean the spell in the proper direction or change the spectrum entirely to see your magic flourish. I started with this principle and then I went to the beginning of the Hermetic Spellcraft articles and read through them all the way back to here. They are great articles and lead me to want to explore more of what you have explained so concisely. Thank you for offering your worldview to us in easily understandable terms! Great work! Of course! I'm so glad they're helpful. That means so much to me. Thank you so much, Mrs. K!